Roukli is said to be the most abstract film in the Competition section of the 28th Tokyo International Film Festival. Set in a world heading to an apocalypse under attack from an unknown enemy, this is a suspenseful human drama describing a closed-room scenario involving sister and brother, and several others. 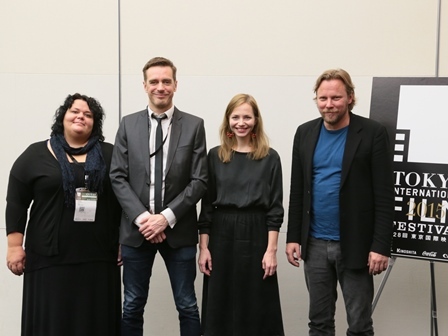 Several interpretations were discussed during screening, and we heard what director Veiko Õunpuu, producer Tiina Savi, and lead actors Juhan Ulfsak and Mirtel Pohla had to say from the intent behind the project to the interpretation. Please tell us about how long it took from the planning stage of this film to shooting, and what kind of difficulties you encountered. Director Veiko Õunpuu (Director Õunpuu below): It took about a year from the start of planning until the end of shooting. It took about a month to go from establishing the idea to the start of shooting. This film was actually an experiment in film production. We had to keep the production costs as low as possible, and using methods like crowd funding, we shot it with a minimum budget. Tiina Savi: The crowd funding had been organized for 2 months, but we started shooting without waiting for the fund to reach its goal, so there were difficulties associated with the limited budget. You can’t do anything without funding, can you (laughs). Director Õunpuu: I think we had about enough for food (laughs). In the initial stages there was no screenplay, so we started making it just from saying ‘Would we want to try the project like this?’ Six cast members involved in production and seven staff making a total of 13 people were the sponsors, so nobody got a guarantee. Something I have learned through experience is that if the initial plan and idea is solid, then it will turn out to be something good as it goes along all by itself. Something we were very particular about with this film is that it was experimental in relation to conventional films. It is usual for films to be made up of three parts. First you have the introduction of characters and an explanation of circumstances, then next there is some sort of conflict or problem, then lastly we head towards the resolution. I think that this structure is very boring, as it’s easy to predict the end before it happens. This film is an attempt in relation to this. I’m sure that some people will get lost watching it, but if you can get on board with the story, it will be a different type of movie experience. I think the dramatic setting is the easiest thing to understand. Were the circumstances really war to begin with? Or, was some kind of divine punishment handed down, making everyone disappear? Director Õunpuu: We have avoided giving a detailed explanation as to whether this is war, or banishment, making it a slightly more abstract story. This is a single closed-room drama with four characters set in a house somewhere, with some sort of ill-defined threat that’s closing in from the outside. The relationship between the four characters becomes increasingly tense due to this threat. Here, the ill-defined outside threat is being used as a tool to establish the storyline. To explain a little further, if I go back to the concept of ‘what is a film’, to me one aspect of a film is the telling of a story. And then, and this is the pivotal theme that I most wanted to search, there is the theme of how a film or a story is born. This film is an experiment that seeks how to edit, how to construct, and how to frame, in other words how to create a film. Was the threat modeled on something? Director Õunpuu: The invasion of the Ukraine by Russia. I remember feeling at the time that we might also be impacted, and the war felt extremely close at hand. The threat from that time is a sort of motif for this project. However, the most important thing I wanted to do was experiment. I wanted to question what people are like in the middle of a war situation. Although I don’t give an answer. Did you feel that the performance side was full of unknowns? Mirtel Pohla (Pohla below): I had trust in the director from before, so when the offer came in I decided to accept straight away. I also knew the staff from before, so communicating with them was like talking to old friends. Juhan Ulfsak: I felt the same. A lot of people said they liked it better the second time. I think that the character that I play Jan himself has a lot of similarities to me, and conceptually, for me this character was easy to understand. There was no difficulty in that sense of the meaning, but it was quite difficult for me to become one with the body of Jan. When it becomes like that, it turns into a situation like ‘you’re just playacting’. This is not satisfactory. Pohla: Some parts of it were difficult, but for how unclear the story was, there was interest in the fact that each performer was able to perform using their imagination freely. And last of all, to the director, what was this universal “threat”? Director Õunpuu: The subconscious. The unconscious. The unconscious can be accessed through still or moving images, and Jung said that it is possible to have a dialog with your unconscious. However, if you are no longer able to do that, then it is a one way street. Now, because there is insufficient awareness in people’s own unconscious that war is occurring in the world, I wonder whether there are many people who race into attack not knowing that their unconscious is being controlled.